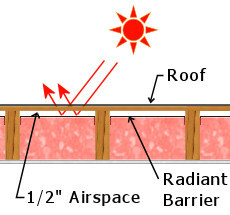 You must use perforated Radiant Barrier when installing it in a cathedral ceiling. Run the 24" or 26" wide strips in the same direction as the ceiling joists. The image below shows a 26" wide strip of RB-Ind. Staple the appropriate width material between joist leaving 1/2" to 1" airspace between the radiant barrier and roof decking. Fill the remaining joists space with regular mass type insulation. Adding a 2x2 strip of wood give even more space for insulation. Attach drywall or interior finish below. This method of installing ceiling insulation is a variation of the installation mentioned above. While installation is different the end results of cathedral ceiling insulation are basically the same.™ The full 48" wide strips are run perpendicular to the direction of the ceiling joist. Run the strips perpendicular to the direction as the ceiling joists. Wrap the material around the joist and up into the cavity stopping about 1/2" to 1" from the roof decking. Span the vaulted ceiling insulation material across the cavity and run back down the next ceiling joist. Overlap each strip by roughly 2". 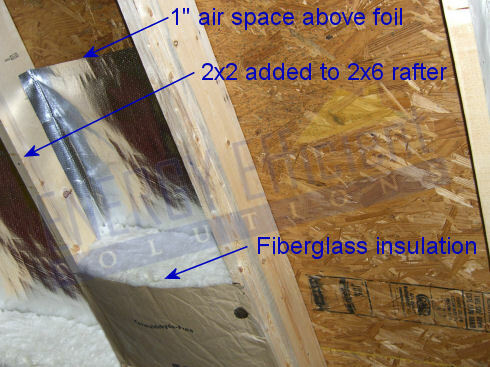 Fill the remaining joists space with regular mass type insulation.